In response to the current renewed interest in ceramic tiles, Craven Dunnill has added their new Wood-Ker design to its Renaissance Collection. 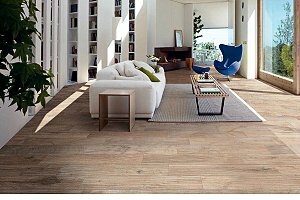 The Wood-Kerr Ceramic Floor Tiles pictured here, combine a quality wood-effect with the practicality of ceramic, as well as fade resistance, durability and easy cleaning. The subtle detail of the surface pattern and shading, achieve an extremely realistic sawn wood-grain effect, revealing both the cross cut and end grain features of natural wood. Wood-Ker is available in 1000 x 144mm ‘planks’, with a choice of four colours: Brown, Nut, Cream and a Grey, which is particularly appropriate for the blue natural light typically experienced in the UK. Price around £93.80 m². Craven Dunnill has also introduced the new Sands flooring made from porcelain, which looks exactly like natural English volcanic slate, similar to that quarried in the hills of the Lake District, to provide another attractive tile range for the English home. Sands features distinctive slate markings and subtle shading, with a smooth finish and is available as 758 x 453mm floor tiles, in four versatile and natural colours: Dark Sand, Ivory Sand, Brown Sand and Grey Sand. Retails at around £70.15m². Craven Dunnill is an award winning retailer of ceramic floor and wall tiles. Please visit the website to view Craven Dunnill’s wide-ranging collections of floor tiles.